The President this week said that anyone watching TV would feel there is no government. While some people may argue that it is a creation of some sections of the media and the opposition, some others would say it is the actual state of the country. Where there is no discipline or order and often decisions are not thought through by people of substance. The President and the Prime Minister must take control of the country. For a start before unveiling the big stuff, the hygiene issues like the garbage and health risks in the city, must be addressed. 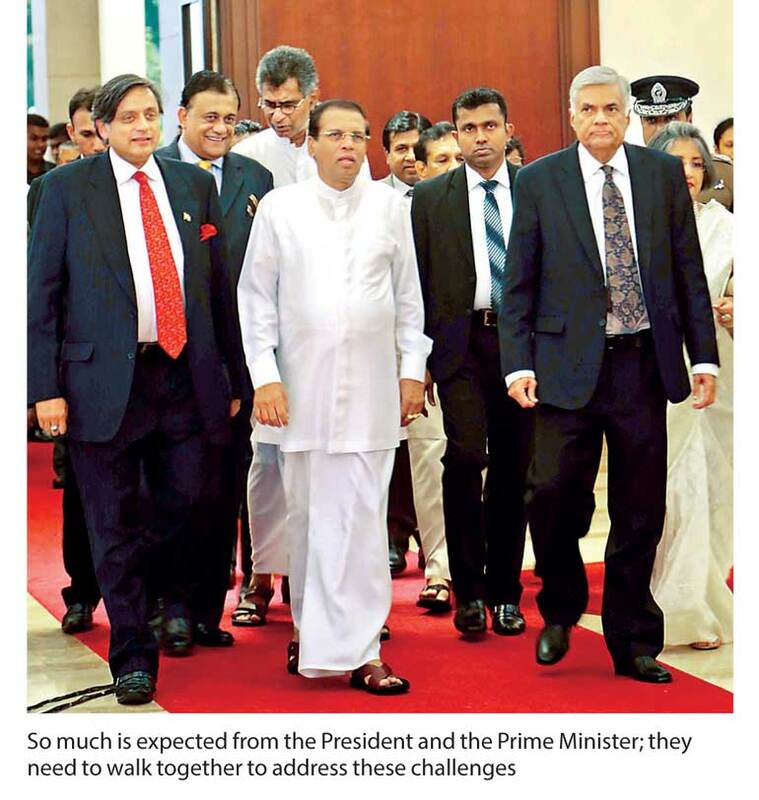 Someone must be entrusted to take back Colombo City, which is now dubbed ‘The Garbage City’. We have a situation that looks like many things are totally out of control. The country needs decisive leadership and leaders who put the country first to address many of the issues we are currently facing. For example, if SriLankan Airlines is so badly managed as some Government Ministers claim, the President and the Prime Minister must hold those people in charge responsible for their action, if found guilty they should be sacked. The airline belongs to the public, not to a handful of private shareholders. We often refer to the late Lee Kuan Yew. Many years back he told a group of civil servants “Don’t change ‘No’ to ‘Yes’. Don’t be a fool. If there is a good reason why it is ‘No,’ it must remain ‘No’,” but tell the public politely. In 2011, I listened to Lee Kuan Yew officially launch his book titled ‘Lee Kuan Yew: Hard Truths to Keep Singapore Going’ at the St Regis Singapore. He spoke passionately of the need to promote meritocracy. Undoubtedly, his uncompromising stand for discipline, consistency, meritocracy, efficiency and education during his tenure as Prime Minister transformed Singapore into one of the most prosperous nations in the world. He is unquestionably, one of the outstanding world leaders of the last hundred years. Few leaders have so far matched Mr Lee’s achievement in propelling Singapore from Third World to First World. Moreover, he managed it against far worse odds: no space, no water, beyond a crowded little island; no natural resources; and, as an island of polyglot immigrants and not much shared history. Some people have dismissed the relevance and transferability of the Singapore experience with the off-hand remark that Singapore is too small to offer any lessons of value to larger countries. Tell that to the world’s two most populous countries that Singapore doesn’t matter – that its mindset and psyche of governance is not scalable, for example India declared a day of mourning at the passing of Lee Kuan Yew and the reiteration by the Chinese leaders that China emulated many of Singapore’s policies after Deng Xiaoping’s visit to Singapore in November 1978. Unlike Lee’s friend Deng Xiaoping, Lee worked on a small canvas and demonstrated that an impoverished country can turn into a flourishing one with strong and engaged leadership. Singapore’s per capita income in 1959 was about $400, today it is in excess of $56,000 and has reserves of over $ 343 billion. Lee Kuan was perhaps the last of that generation of leaders who guided their countries through the challenges and turmoil of decolonisation to independence. It is hard now to recall how difficult and challenging those times were for Singapore. He brought Singapore into being a sovereign independent state against the background of the fight against communism in the Malayan Emergency, the contest with Sukarno’s Indonesia in Confrontation, the bitter split from the union with Malaysia, and Britain’s strategic withdrawal from Asia. He found himself leading a country deeply divided on religious and ethnic lines, surrounded by powerful potential enemies, with a weak economy and no natural resources at all. Those who criticise the authoritarian style of government he developed to deal with all these issues need to consider the scale of the challenges Singapore faced. Lee’s PAP offered the people of Singapore an implicit deal: in return for accepting his system of politics, he offered them stability, security, clean government and prosperity. And he delivered on that deal way beyond anyone’s wildest dreams — including perhaps his own. Lee demonstrated that superior performance requires superior leadership. Lee demanded of leaders both intellectual and moral superiority. Contrary to modern Western democratic theory that emphasises citizens’ participation in governance, his views were closer to Plato’s conception of the “guardians,” or China’s historical Mandarins. Through all this he demonstrated that good government is only possible when leaders put the public good unquestionably above their own personal interests. Singapore today has the third highest per capita GDP of USD in the world, measured in PPP terms, behind only Qatar and Luxembourg. It is 50% higher than Switzerland’s, and double of Australia’s. That is the scale of his achievement. There can be few examples in history of such an outstandingly successful nation created so completely by the vision, will and leadership of a single individual. Mr. Lee was a firm believer in meritocracy. He would often say, “We decide what is right. Never mind what the people think,” as he put it bluntly in 1987. Lee Kuan Yew, the man behind modern Singapore clearly left a political legacy behind that demonstrated beyond doubt that superior and moral leadership can turn an impoverished country into an economic powerhouse and the ultimate test of the value of political leadership is whether it helps a society to establish conditions which improve the standard of living for the majority of its people. In the final analysis, we like to hear the President or Prime Minister saying like PM Lee often said during the 1964 economic and political crisis in Singapore, “Don’t worry we have taken control of the situation” and then demonstrate that with solid results.